When their friends were dying of AIDS or being evicted from their homes, two friends decided to take on San Francisco’s housing crisis. 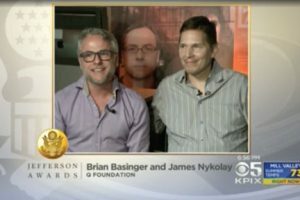 Fourteen years later, not only are they helping AIDS survivors, their non-profit has expanded to help the entire LGBT community. And they are this week’s Jefferson Award winners. The money raised from portrait sales will go to the Q Foundation and the LGBT Asylum Project. 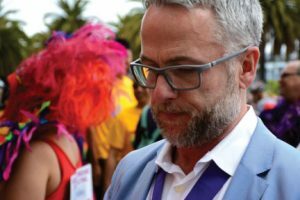 For years after he founded San Francisco’s AIDS Housing Alliance in 2004, Brian Basinger was paid only what would fit within the limits that Social Security Disability Insurance would allow. But Basinger, a gay man who’s living with AIDS himself and remains executive director of what’s now known as Q Foundation AIDS Housing Alliance, recently had to make a change. A transgender cultural district is being formed in the Tenderloin, with support from the developer of a major project that will soon span the heart of the preserved area. 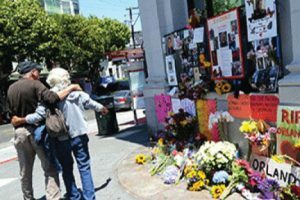 District 6 Supervisor Jane Kim yesterday introduced a legislative package to develop the Compton’s Transgender, Lesbian, Gay and Bisexual (TLGB) District, which would span six blocks of the lower Tenderloin and cross over Market to encompass two blocks of Sixth Street. 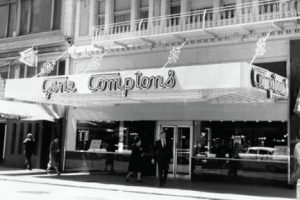 After a complicated back-and-forth process between local activists, politicians, and the developer of a large hotel and condo complex on Market Street, San Francisco will designate the nation’s first transgender historic district located within the Tenderloin as the development project moves forward. 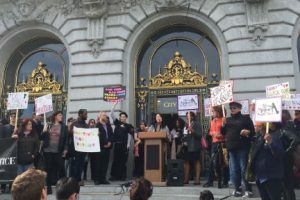 Supervisor Jane Kim announced the deal, which she helped broker, on the steps of City Hall today, also introducing legislation to define the district. That’s to be called Compton’s TLGB District: A reference to a historic local uprising and an arrangement of the acronym more commonly rendered as LGBT that serves to highlight the contribution of trans people in that uprising, the district, and the queer rights movement generally. The official district will comprise six blocks in the southeastern Tenderloin, crossing over to Market Street to include two blocks of 6th Street. As of last fall, local advocates citing historic LGBT sites in the area were hoping to halt Developer Group I in its efforts to build a 12-story mixed-use project at 950-974 Market with 250 residential units, 232 hotel rooms, and ground floor retail space. Tenderloin nonprofit the Q Foundation, an extension of the AIDS Housing Alliance, was at the helm of the preservation effort, led by Brian Basinger. The Q Foundation cited LGBT bars in the area, like the Old Crow at 962 Market, which served the neighborhood’s well-represented LGBT population from 1935 until it closed in 1980, and the Silver Rail at 974 Market. 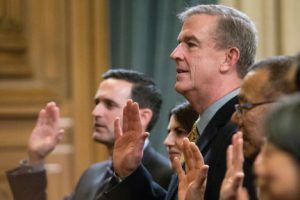 Citing the voters’ decision not to approve a sales tax increase last fall, San Francisco city officials have not restored $3 million in housing subsidy funds, setting off a scramble so that low-income people, including those living with HIV/AIDS, can get shelter. 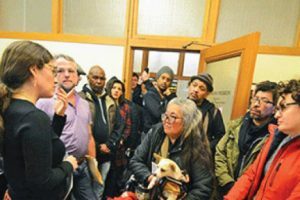 Last week, about two-dozen clients of the Q Foundation met at City Hall to implore the Board of Supervisors to restore $1.6 million in housing subsidy money that had been cut by Mayor Ed Lee, according to Brian Basinger, executive director of the Q Foundation. Q Foundation provides rental assistance subsidies to low-income people with AIDS and other disabilities, as well as to low-income LGBTQ seniors. San Francisco’s first openly HIV-positive supervisor, Jeff Sheehy, is already facing his first major task from his community. Nearly 250 people bordering on homelessness, many of whom are diagnosed with HIV/AIDS, are seeing their housing subsidies cut by Mayor Ed Lee. Will Sheehy push to restore that funding? Mayor Lee made the cuts in the wake of 2016’s failed Proposition K, which promised millions of dollars for San Francisco homeless programs. That includes a $3.1 million cut in funding to the AIDS Housing Alliance, leaving potentially dozens of homeless and HIV-positive San Franciscans at risk. Some may sleep on our streets, a “solution” no one wants. The mayor approved 2016’s budget last year, with millions of dollars factored in under the assumption Prop. K would pass. But as moderate and progressive Democrats tussled over a ridiculous number of propositions on last year’s ballot, Prop. K failed under a sea of in-fighting — including the god-awful, hate-filled Proposition Q, authored by Supervisor Mark Farrell, which promised to take tents away from people living on the street. According to Brian Basinger, head of AIDS Housing Alliance, Mayor Lee said he would not release the $3.1 million to the organization — crucial to subsidize (and not even fully) housing for at least 250 San Franciscans — after Prop. K failed.